The owl was a frequent choice of inspiration for John, as it symbolises wisdom. This powerful bird glares out, as if challenging the viewer to disagree. The mournful face of its prey peeps out from under its talons. This is a genuine work by John Takawira from 1988, and has the key elements sought by a collector of his work – the intelligent use of the rough surface of the raw stone, the cultural and spiritual significance of the subject matter, and the substantial form and presence of the work. It is accompanied by full documentation from the original gallery in Zimbabwe. 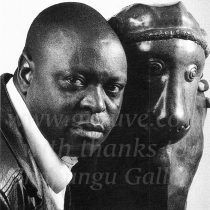 Works by either John or his brother Bernard Takawira are very rare on the secondary market. This piece has his characteristic feather-like touch – the majority of the sculpture comes from the texture and form of the raw material and his chisel made superficial marks that release the sculpture within, that suddenly reveals itself to the viewer, while Takawira saw it all along.